Kitchen in rental studio next to my house. I actually have two kitchens. 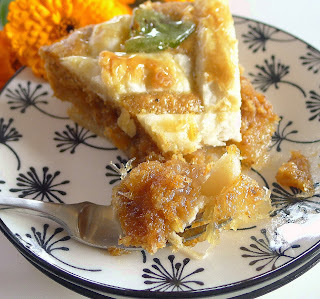 One, in my own house, is where I cook for family and friends, test recipes, photograph food for this blog. The other, more of a kitchenette, is part of the studio/guest house adjacent to my home. We built the studio as a place for grandparents to stay when the kids were growing up. Now, they’re grown and I’m the grandmom, so we’ve fixed up the studio for vacation rentals. 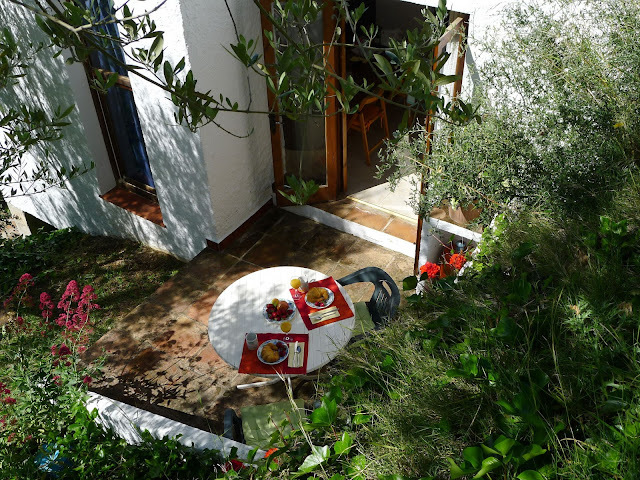 The hillside studio (sleeps two) is tucked among the olive trees at the top of an arroyo with glimpses of the Mediterranean beyond. 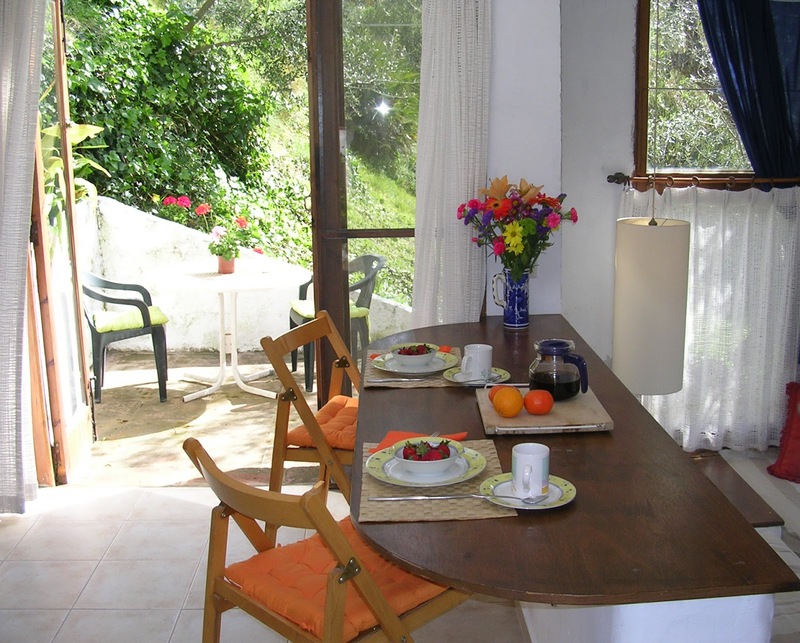 The charm of this property is its secluded location where you can feel completely private. It’s the perfect hideaway for two people who want a home base for exploring Andalusia or a tranquil retreat for lazy days in the sun. You can cook up a storm or just uncork the wine and slice the cheese. Breakfast bar opens onto a small terrace. 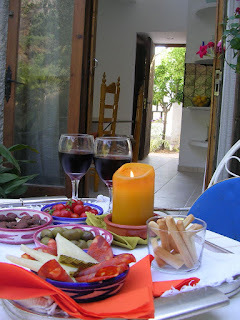 or, wine and tapas in the evening. If you’re looking for an activity vacation, you can also join me in my kitchen for cooking classes. 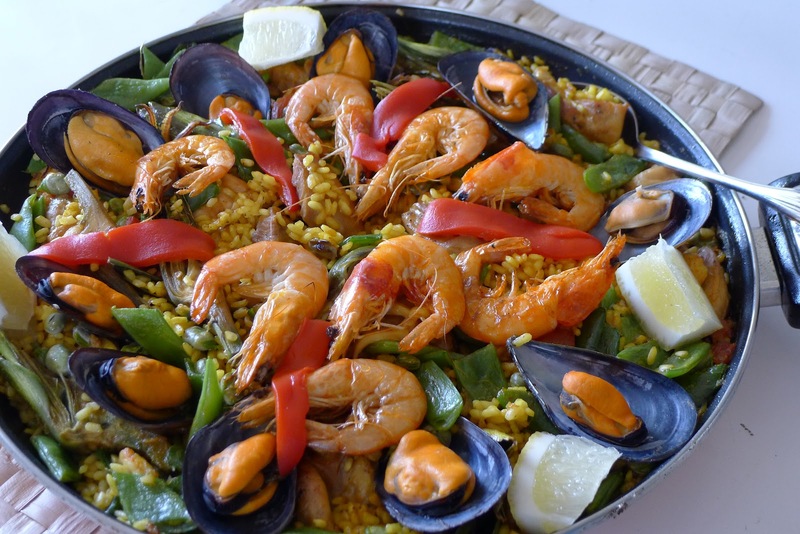 Learn how to make authentic Spanish paella or create a whole tapas party. Get the low-down on cooking seafood. Enjoy a wine and cheese tasting. 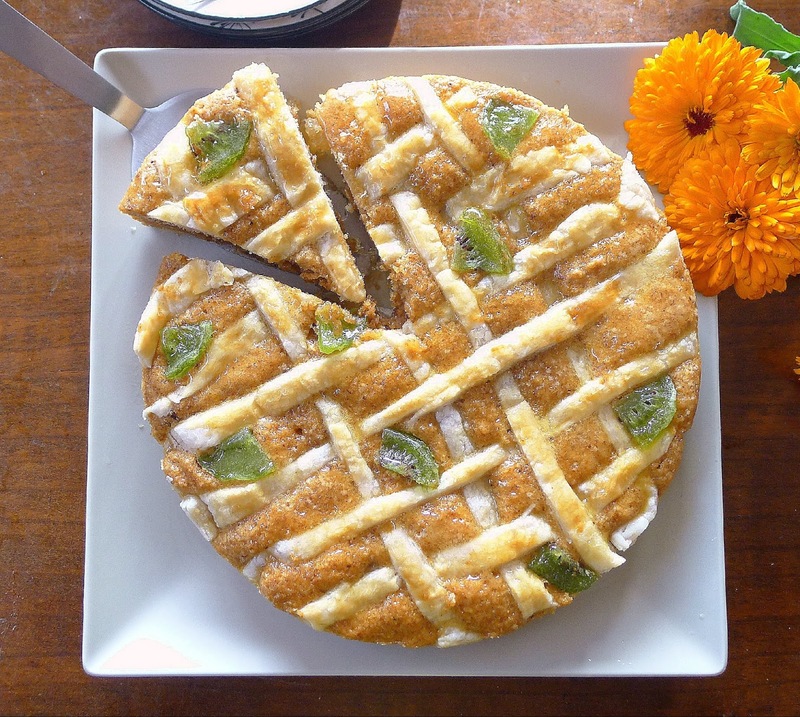 I will tailor classes to suit you—a fun afternoon in the kitchen and a few hours at the table or a more intensive three-day course with visits to market and olive mill. Learn to make an authentic Spanish paella. 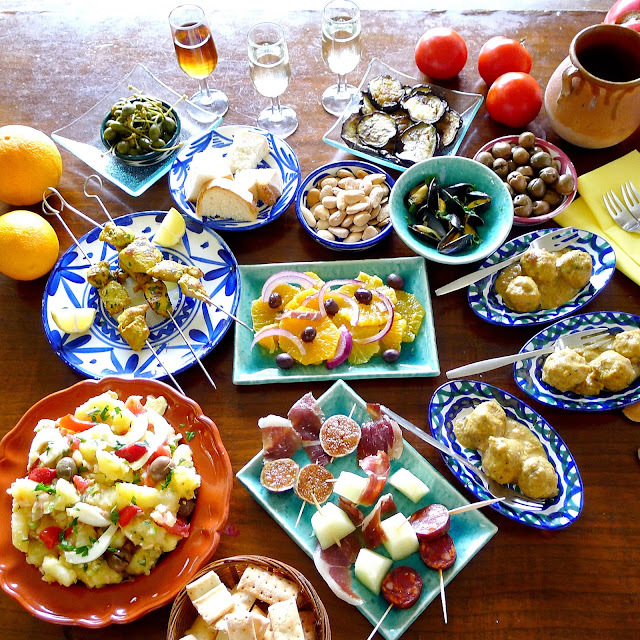 Sample Spanish cheeses with accompanying wines. Meatballs, salads, potato tortilla--you'll create all these dishes for a tapas party. 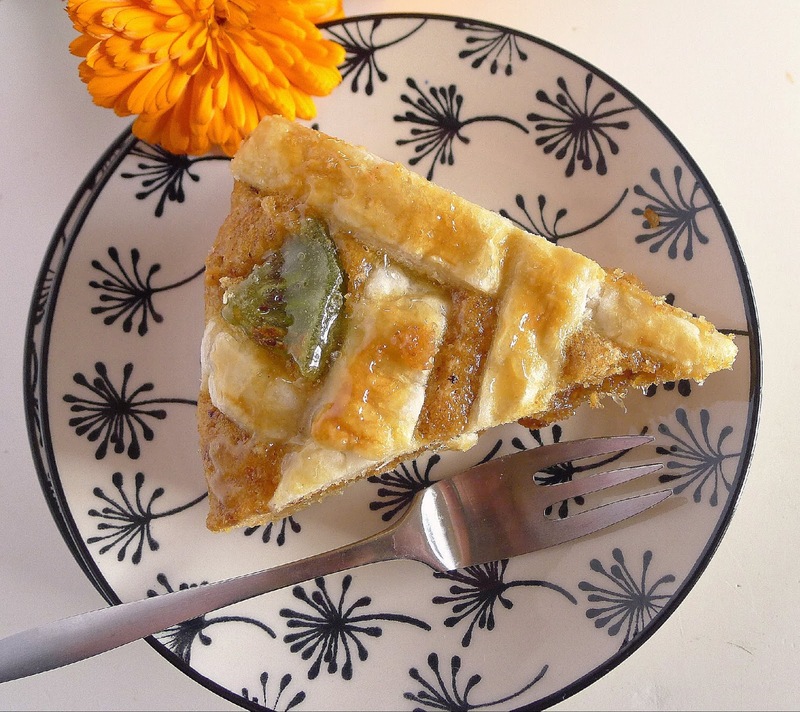 Three-day cooking classes with Sarah and Rosemary. 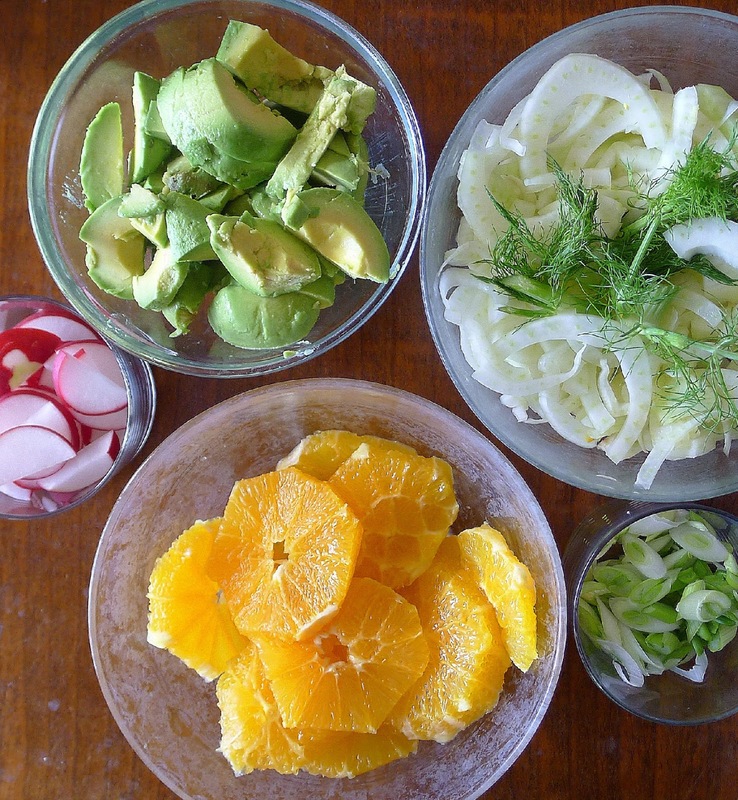 Oranges and avocados are on the way out; fennel and radishes are coming in. 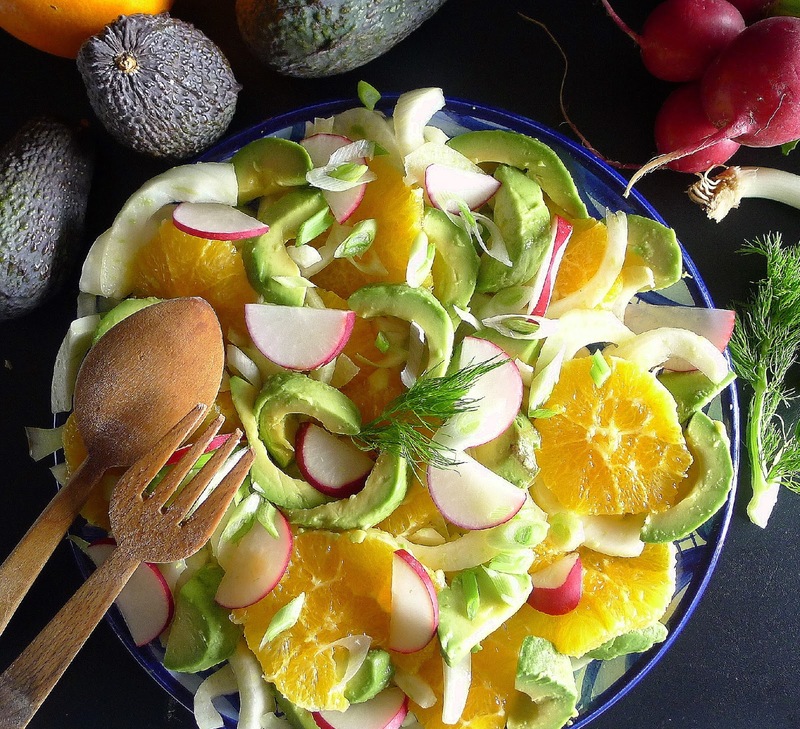 A salad to mark the change of seasons. It’s a season of contrasts as winter transitions to spring. Warm sunshine follows on stormy days and bitter winds. Sometimes in a single day I go from bundling in layers of sweaters to sitting in the sun in short sleeves. In the kitchen, too, I am in transition. I’ve got a crate of oranges and another of avocados. Both winter fruits, they need to be picked from the trees in the orchard before spring brings new blooms and growth. 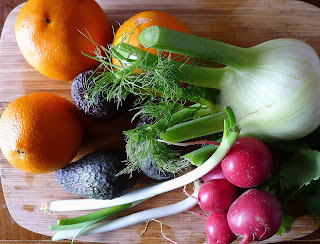 At the same time, I’ve got fresh fennel, sweet radishes and sprightly spring onions. 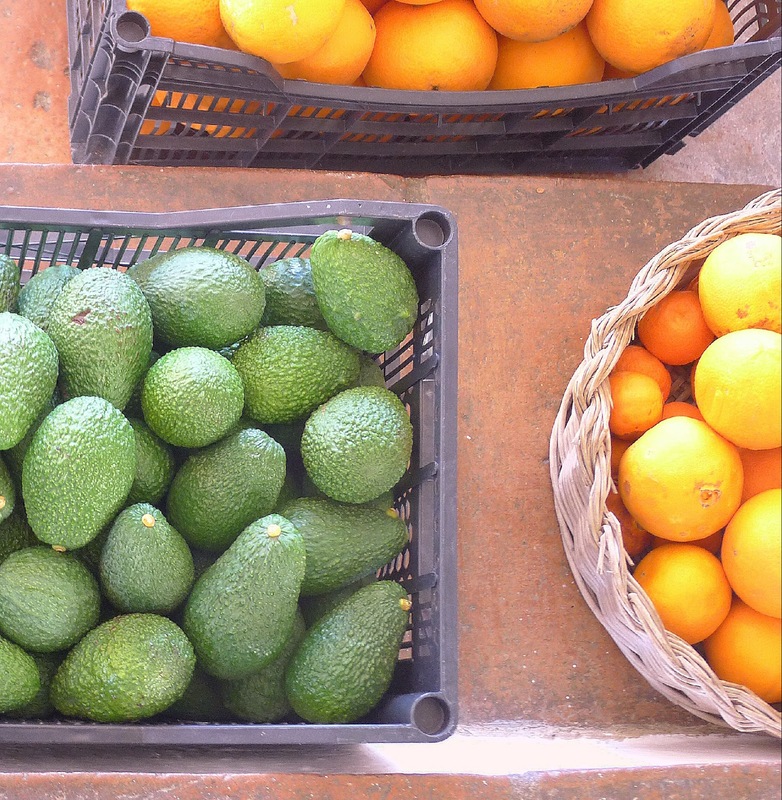 The last picking of winter fruit--crates of oranges and avocados. 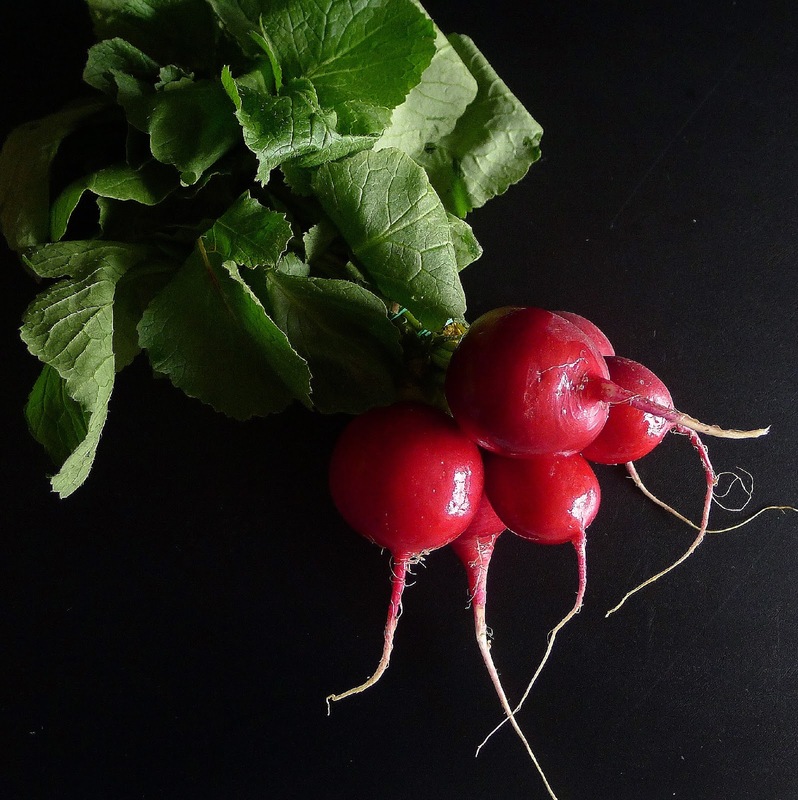 Sweet, with a mild bite--spring radishes add color and snap. 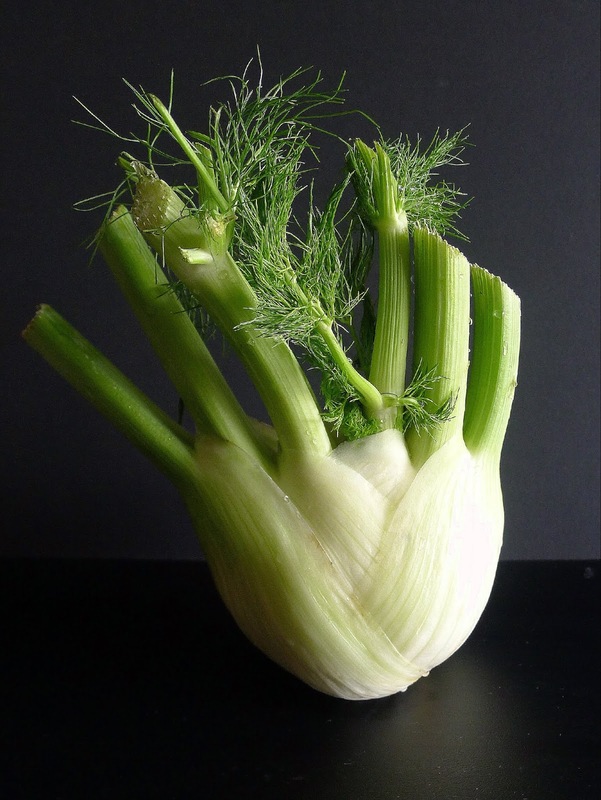 Raw fennel has a delightful crunch, a subtle anise flavor. I tossed them all together, winter and spring, for a salad of contrasts, perfect for a transitional season. 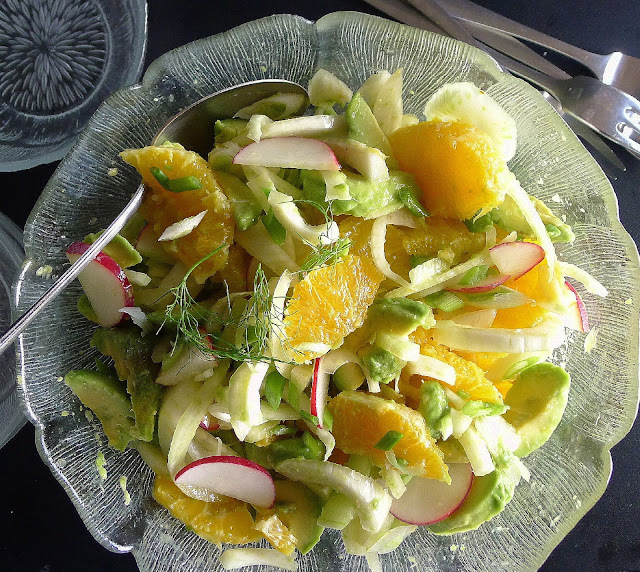 The salad has contrasts in texture—crunchy raw fennel, buttery avocado, juicy oranges. In color—green, red, orange. 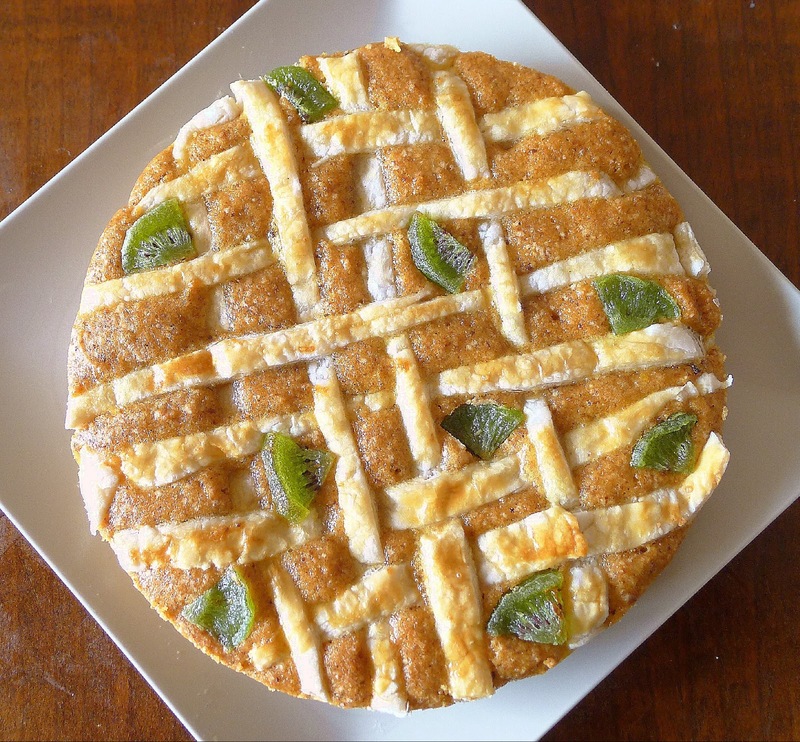 In flavor—sweetness of oranges, subtle anise of fennel, mild bite of radish and spring onions. or tossed all together in a salad bowl. 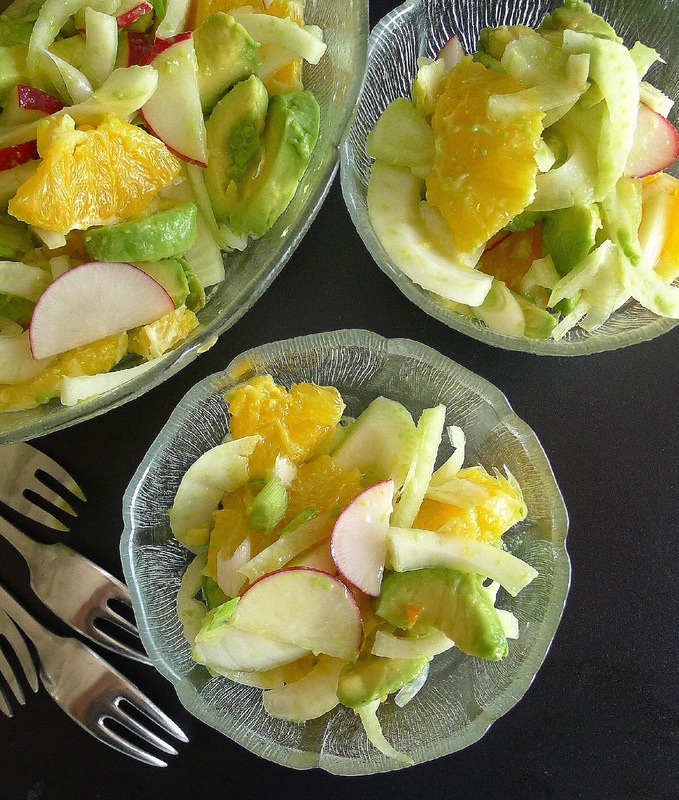 The ingredients for this salad can be layered on a platter or tossed together in a bowl. The salad can even be prepared a day in advance, although, if you choose this method, be sure to garnish the salad before serving with some freshly chopped onion and green fennel fronds to freshen it up. 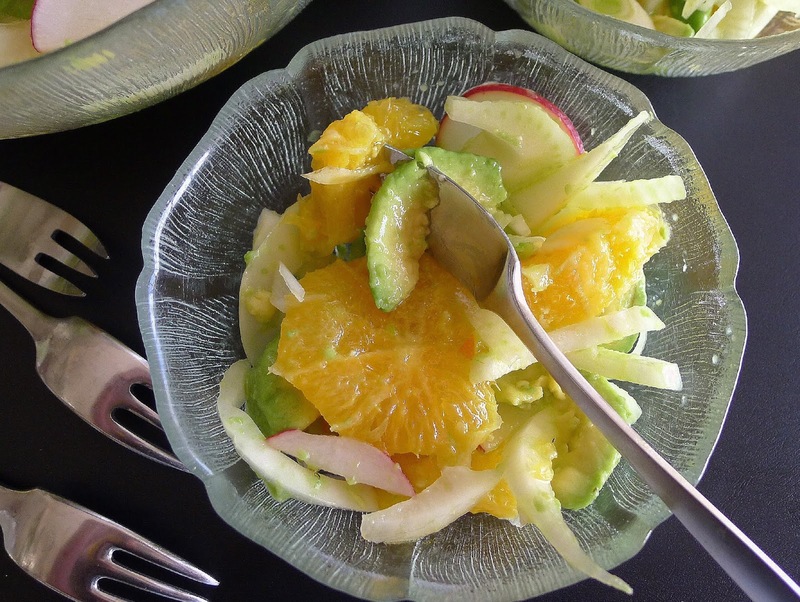 You should have about 2 cups each of sliced fennel, oranges and avocados. 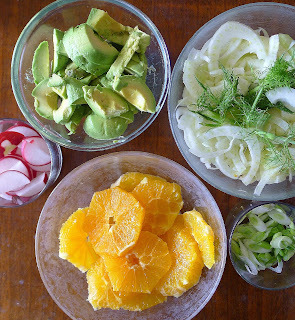 Ingredients for a winter into spring salad: oranges, fennel, radishes, spring onions and avocado. Trim the fennel of tough outer leaves. Save green fronds for garnishing the salad. Cut the bulb into quarters and cut away the core. Thinly slice the fennel crosswise. 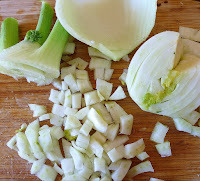 Place the sliced fennel in a bowl and sprinkle with salt. Place oranges on a cutting board. Cut a thin slice off both ends. 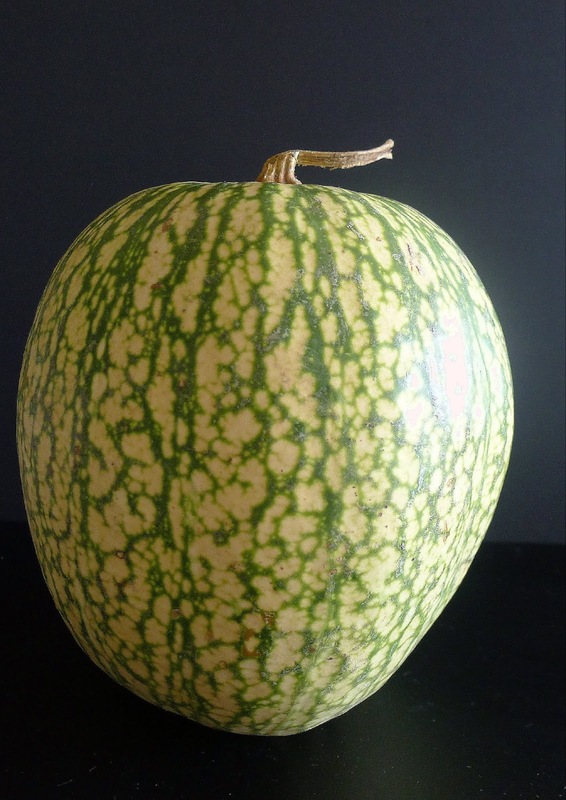 Cut downwards, removing peel and white pith. 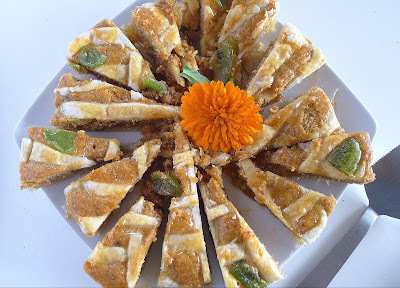 Slice oranges crosswise. Discard any seeds or membrane. 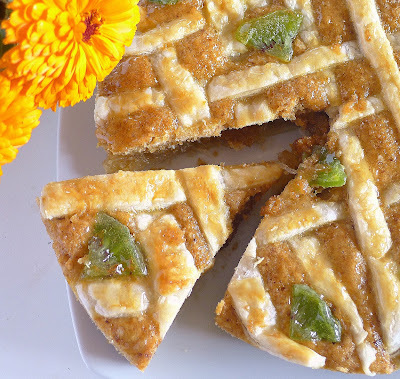 (Slices can be left whole, cut in half or cut in bite-size pieces.) Place the sliced oranges in a bowl. Sliced and ready to combine in salad. Peel and pit the avocados. Slice them crosswise. Place them in a bowl and sprinkle with salt. Add the olive oil to the sliced oranges. Add 1 tablespoon of the vinegar to the sliced fennel and 1 tablespoon of vinegar to the sliced avocado. Thinly slice the spring onions, including some of the green. 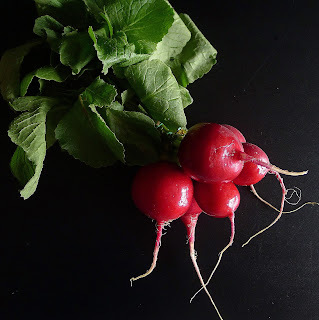 Cut the radishes in half and slice them crosswise. To assemble the salad: Layer the fennel, oranges and avocados on a rimmed platter. Scatter the sliced onions and radishes on top. Pour over all the accumulated juices from the bowls. 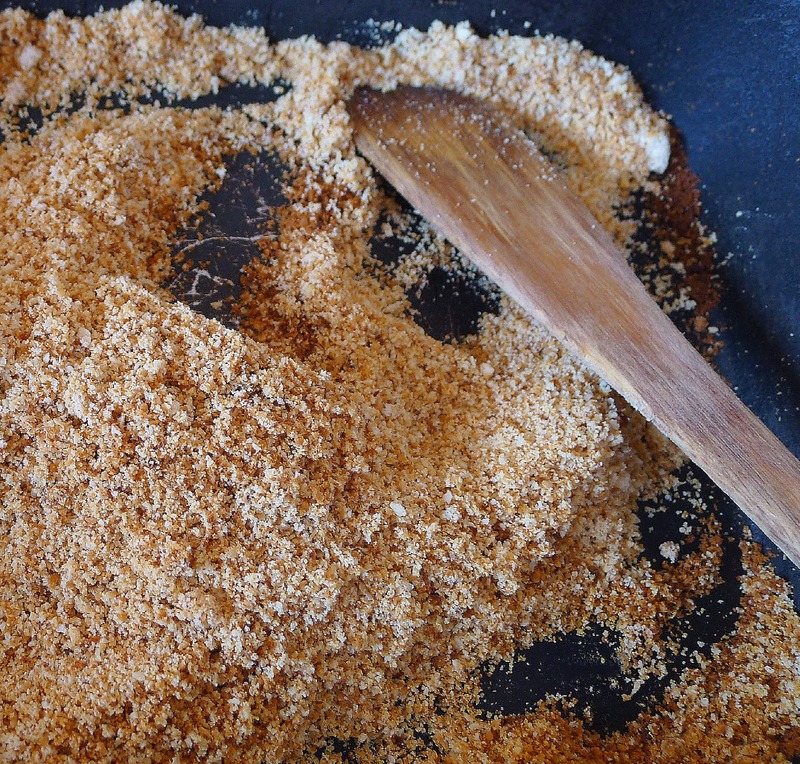 Sprinkle with salt flakes and pepper or red pepper flakes, as desired. Garnish with a few snippets of green fennel fronds. Salad of contrasts in texture, color and flavor. 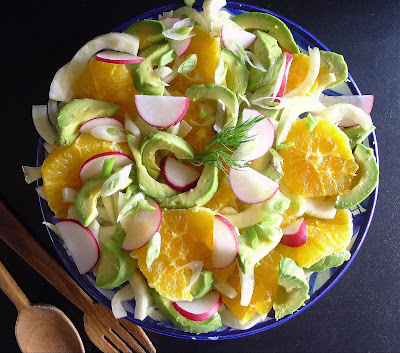 Winter Salad with Oranges and Squash. Chicken with Orange Salad and Olives. Festive Salad with Avocado and Shrimp. 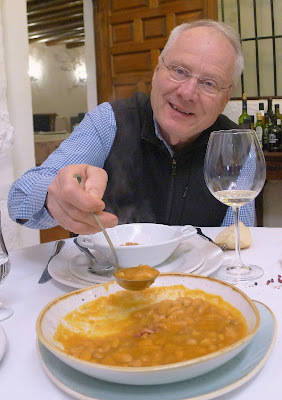 Seated next to a roaring fire, with a brazier of hot coals at our feet and a heavy table cloth tucked around our legs, we sipped fino from Montilla-Moriles, nibbled local olives and waited for soup to be served. 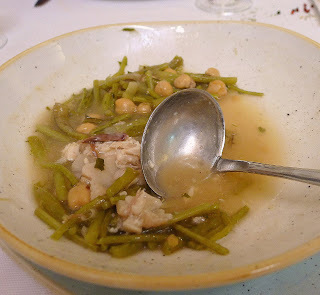 We were lunching at Arte de Cozina, a restaurant in Antequera (Málaga) that specializes in traditional and local foods. Spoons at the ready! One of Andalusia's many traditional potajes, beans with fennel and pork belly. 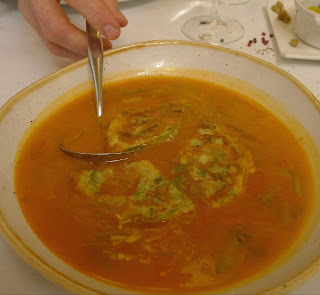 This is adapted from a dish sampled at Arte de Cozina in Antequera (Málaga). It turned out to be a four-spoon lunch, as we sampled our way through the sopas, guisos and cazuelas on the menu. 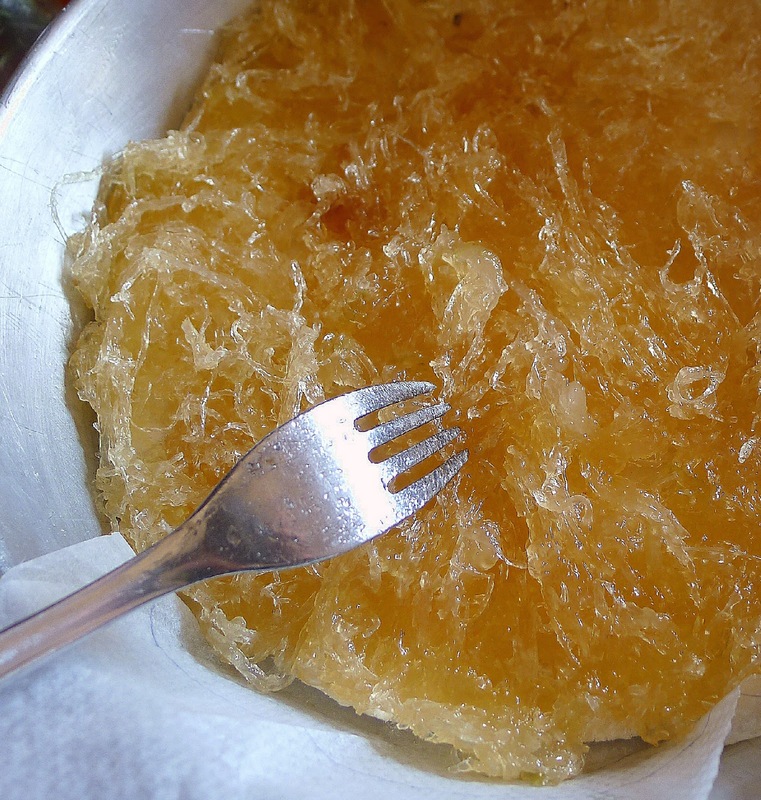 Known as “platos de cuchara,” or “spoon foods.” these are the sort of soups, stews and soupy-stews that you eat with a spoon in one hand and a chunk of crusty bread in the other. 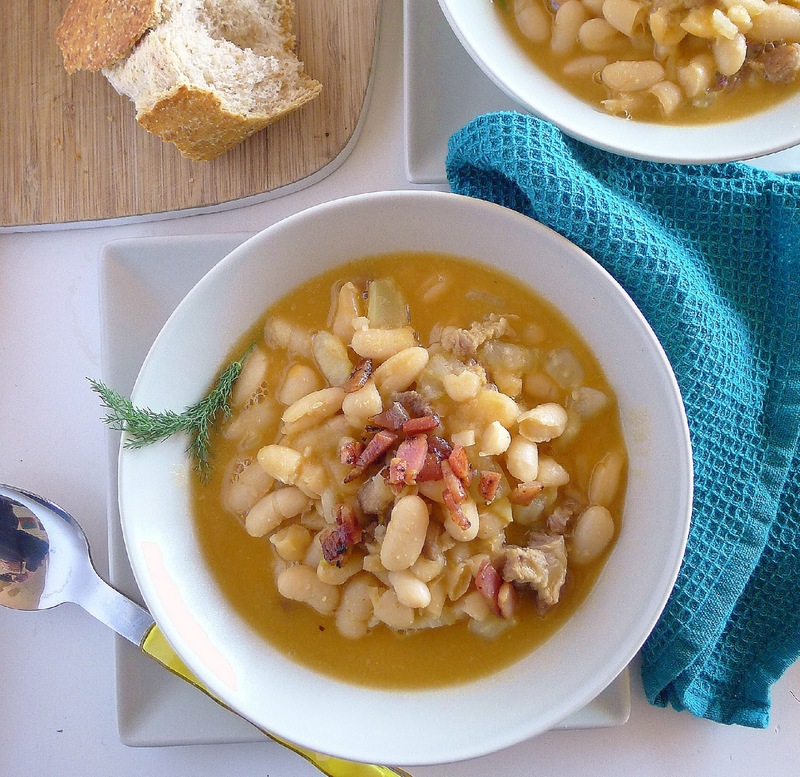 Hearty, heart-warming and heart-healthy, they are a mainstay of Spanish home cooking. 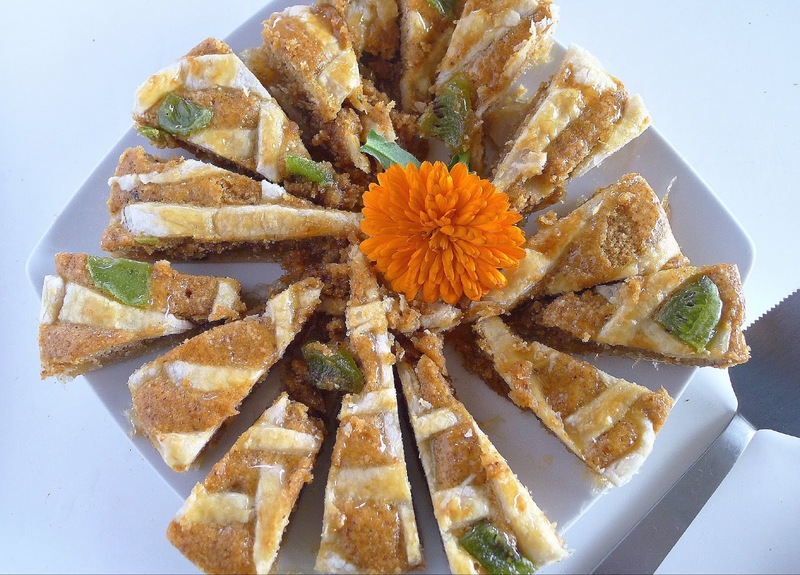 Charo Carmona, chef and owner of Arte de Cozina, bought a village tapa bar 23 years ago. She began collecting and recovering traditional recipes of the region (Antequera is an inland town in the province of Málaga), starting with those learned from her mother and mother-in-law. Today her menu features many historical dishes as well as those of popular home cooking. First of the spoons: porra blanca, a thick "porridge" of bread, Hojiblanca extra virgin olive oil, garlic and vinegar. This is a dish related to the original gazpacho. 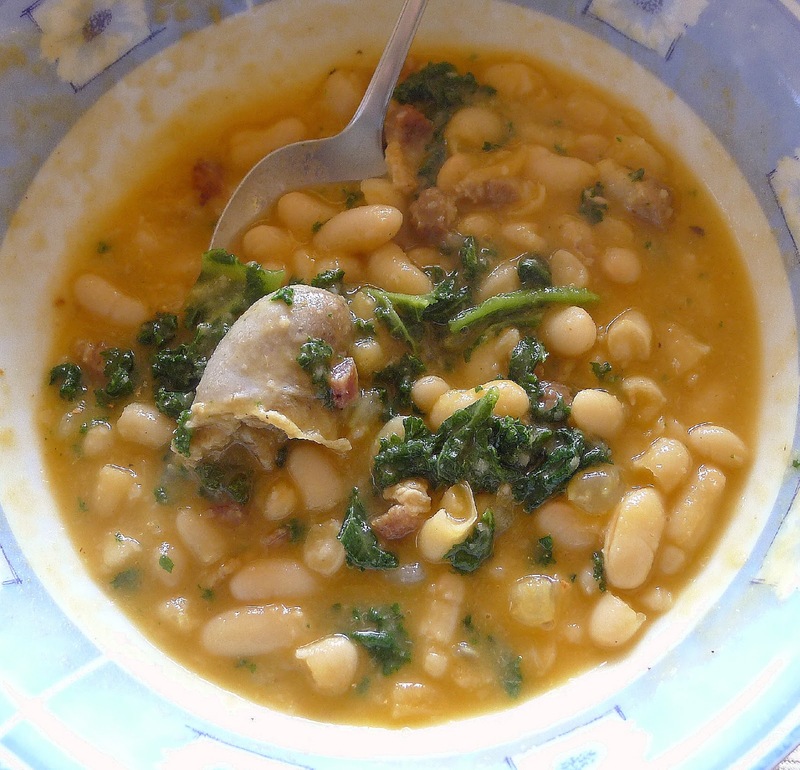 Puchero de tagarninas--a soup-stew with wild thistles. 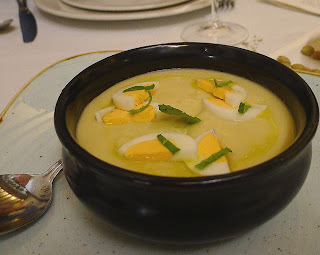 Galipuche--a soup with chunks of egg tortilla made with bitter wild asparagus (esparragos trigueros). My companion on the spoon food trail, Lars Kronmark, professor of culinary arts at the Culinary Institute of America in St. Helena, CA. Chef Lars comes to southern Spain once or twice a year to visit his mother who lives here. We usually get together for culinary explorations or just to have lunch. This is my rendition of one of the soup-stews served at Arte de Cozina--pot of beans with fennel and ibérico pork belly. 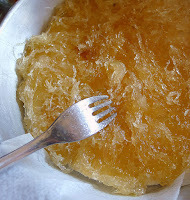 A traditional plato de cuchara--spoon food. Many are complete meals, with legumes and vegetables. Chef Charo explained that she makes this filling stew with fennel bulb (not the stems of wild fennel). Cultivated fennel gives the stew a very subtle anise flavor. 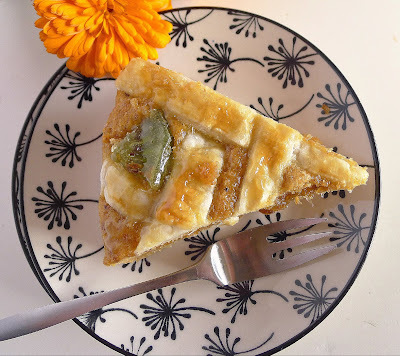 I added wild fennel fronds to make the flavor more pronounced. 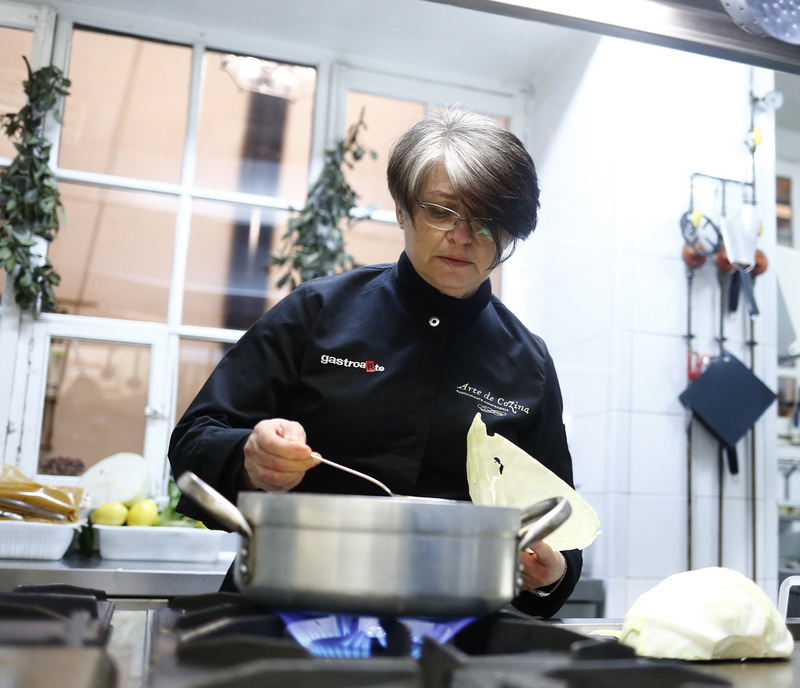 Her version is made with fresh panceta ibérica, pork belly from the ibérico breed of pig. If not available, any fresh pork belly could be used (uncured pancetta). She sprinkles salt-cured panceta that has been crisply fried on top of the finished soup, almost as a seasoning. Bacon is a fine substitute. Put the beans to soak a day before cooking them. If you have very hard water, add a pinch of baking soda to the soaking water. Drain beans after soaking and cover them with fresh water to cook them. 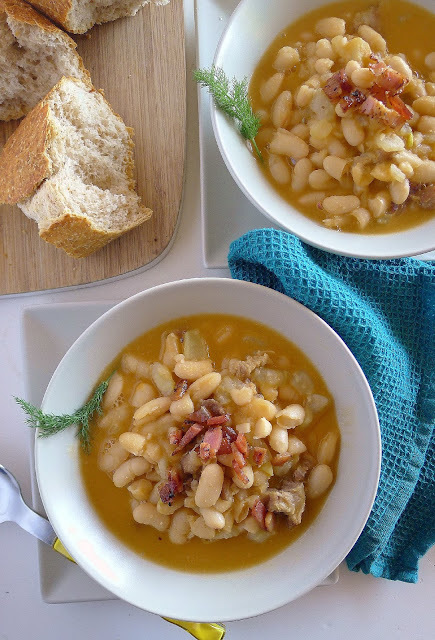 The diced panceta is fried and the crisped bits of meat and fat—torreznos—are added to the beans. The fat is used to make a sofrito that flavors the stew. Fennel bulb, trimmed and diced. Put the beans in a pot and add twice their volume of water. Soak beans overnight (8 hours). Drain beans and return to the pot. Add enough fresh water to cover them by 2 inches. Add the bay leaf, wild fennel, if using, and quartered onion. Bring the beans to a boil. Reduce heat and simmer, covered, 30 minutes. While beans are cooking, cut the pork belly into ½ -inch dice. 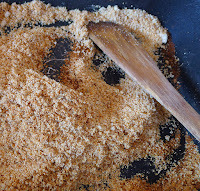 Place in a skillet with the oil and heat until fat is rendered and the bits begin to brown. Skim the pieces of pork belly out of the skillet and add to the pot of beans. Save the fat that has been rendered in the skillet. Trim the fennel bulb of tough outer layers and core. Cut into ½ -inch dice. Add the fennel to the beans with the pork belly. Cook the beans until they are nearly tender, about 30 minutes longer. Heat the fat remaining in the skillet and sauté the chopped onion, green and red peppers and garlic until softened, 5 minutes. Add the tomato and continue frying until the tomatoes are somewhat reduced, 10 minutes. Puree the sofrito in a blender with ½ cup of beans from the pot. 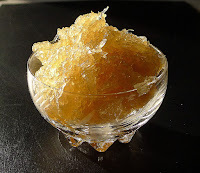 Push this puree through a sieve, discarding the solids. Pour the sieved sofrito into the pot of beans. 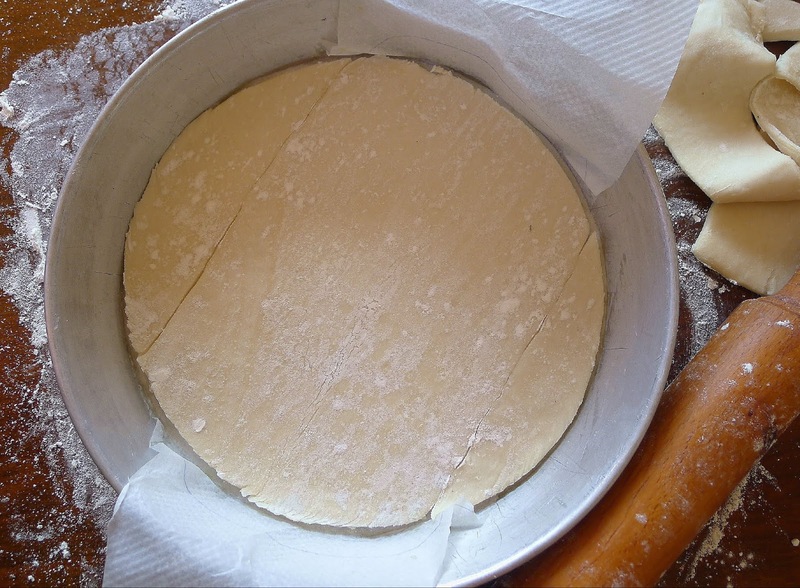 Continue cooking, uncovered, until beans are very tender (about 20 minutes). 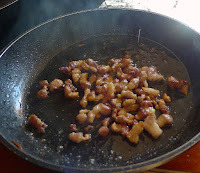 Fry the diced bacon until very crisp. Ladle the beans into bowls (discard bay leaf and cooked wild fennel sprig). Top each with a spoonful of crisp bacon. Garnish with a sprig of green fennel. My variations: I added kale and sausage to the bean and fennel stew. Arte de Cozina tables are in the (enclosed) courtyard of a 17th century house. A roaring fire and braziers beneath the tables keep diners warm even in cold weather. 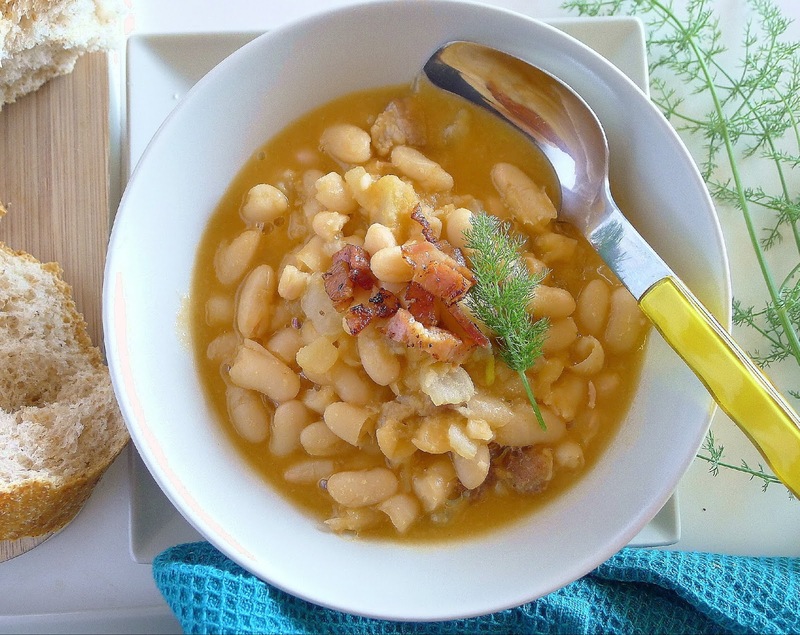 Fennel Soup with Chickpeas, Wheat and Sausage. Restaurante Arte de Cozina, Antequera (Málaga). 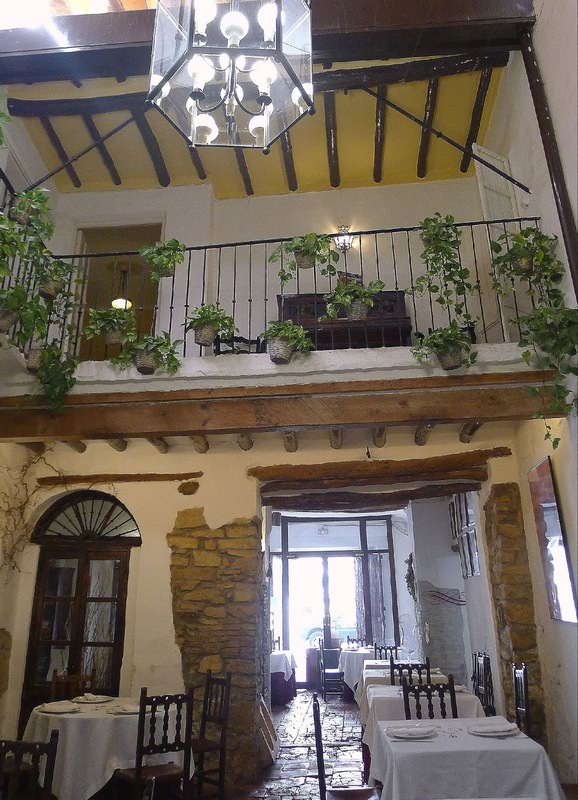 The restaurant Arte de Cozina is situated in a 17th century house in the center of Antequera. There is an adjoining tapas bar and guest rooms on upper levels. 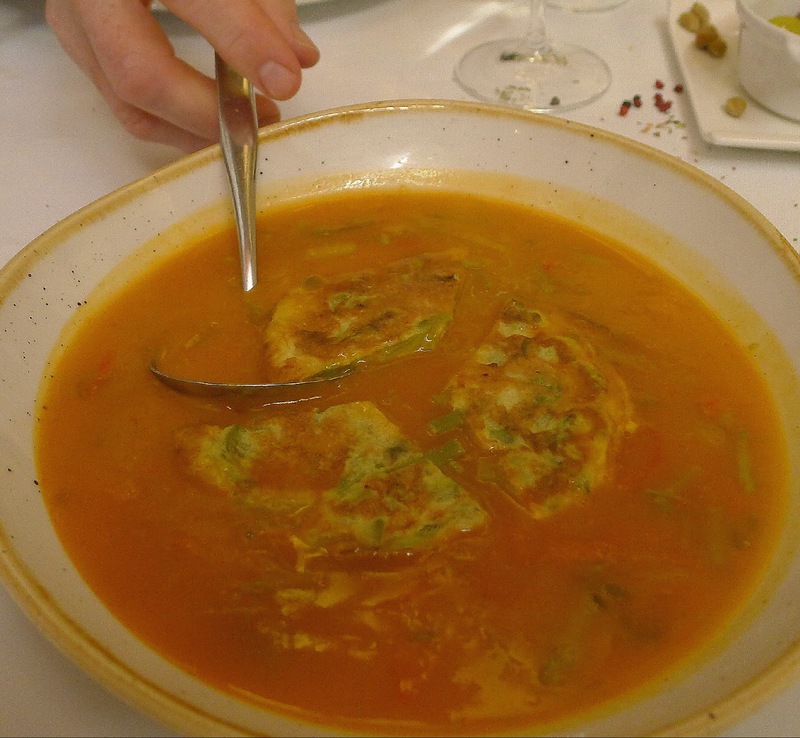 Besides the soups and stews mentioned here, the menu includes main course dishes such as marinated pork loin, baby goat, pigs' trotters and wild partridge and desserts such as bienmesabe and almojábanas.